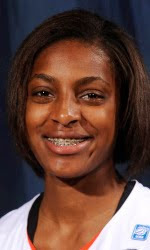 Hasina Muhammad (Ridgeway) may be the only freshman on the Auburn women's basketball team, but she heads into her first season with plenty of accomplishments on the court coming out of high school. The Memphis native was the No. 19-ranked guard in the nation as well as the No. 2 prospect in Tennessee coming out of high school, and made what she says was a pretty easy decision to come play for the tigers. "Auburn is in the SEC, it's not too far away from home, and I really enjoyed the coaching staff as well as my teammates", said Muhammad. "I love the atmosphere here. Everyone is friendly and I really haven't met one mean person since I've been here." Since coming to Auburn, Muhammad has gotten her feel of the campus and begun the process of adjusting to college life as well as going to football games and enjoying some of Auburn's traditions. "My first football game as a student was a lot of fun", said Hasina. "You have to stand the whole time or you won't be able to see the game! As far as adjusting, my teammates have really helped me with that and for the most part I think it's gone pretty smooth. "Tyrese Tanner is my roommate and Parrisha Simmons and Morgan Jennings are like my big sisters. They've really helped me a lot." Although Muhammad is adjusting well, she's still learning how to manage her time being a student athlete. "Time management has been the toughest thing to figure out", said Muhammad. "In high school, you go from class to class, then practice, then you're done. In college, you go to practice, a few classes, then study hall, then another class. It was pretty overwhelming at first." Since arriving on campus, Muhammad has done her best navigating the rough waters that come with adjusting to college life. She said that no matter what, she is going to keep on moving forward and improving every day. "I just have to keep pushing, I tell myself that every day," said Muhammad. "Whether I'm in class or just getting through class, I just have to keep pushing myself." As she continues to adjust to college life with help of her roommates and the rest of the team, she looks forward to proving herself on the court and achieving some of the goals that her and the rest of her teammates share. "Individually, I want to be the top freshman in the SEC," said Muhammad. "As a team, I want us to win the SEC Championship and make it well into the NCAA tournament."